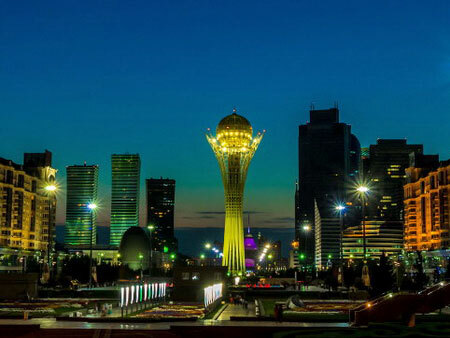 Home » Astana » Major Sights » Baiterek - main symbol of Astana. 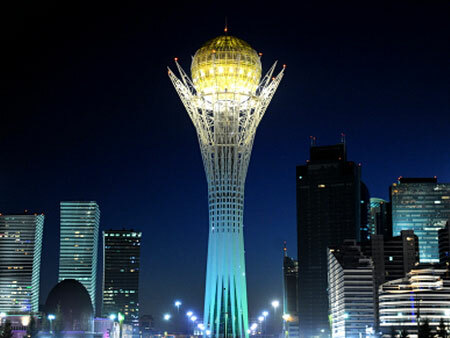 Baiterek - main symbol of Astana. 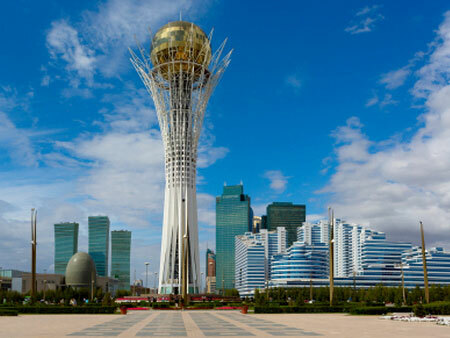 Where is the starting point of your tour around Astana? Of course, it is the symbol of the capital - Baiterek. The monument embodies the idea of the Kazakh people related to the structure of the universe. According to the legend, Baiterek is the tree of life, the destination of the sacred bird, Samruk. It takes refuge in the tree’s high crown to lay a golden egg - the sun - giving life and hope. At the same time, at the roots of the tree the hungry dragon Aydahar is hiding in attempt to eat the egg. That is how the eternal struggle between good and evil is represented. Not far from the monument flows the World River, on the banks of which Baiterek stands propping up the sky with its crown, and holding the earth with its roots. 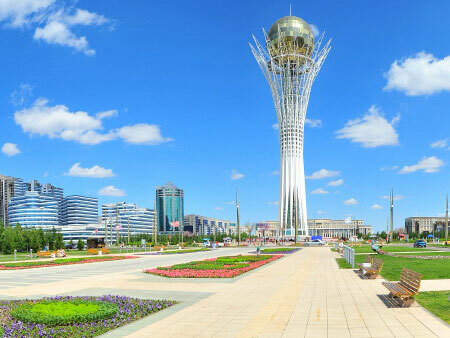 Monument Baiterek was opened in 2002 and has become a landmark in history of Kazakhstan, a new stage in the lives of its people. The structure of the tower symbolizes the three pillars of creation - underground, terrestrial and celestial worlds. At a depth of the four and a half meters is the lower level with cafes, aquariums and a mini gallery “Baiterek.” The height of the building is 97 meters 1997, the year of the new capital proclamation. The metal structure of the tower weighs over 1,000 tons and rests on 500 piles. The tower’s top is adorned with a huge ball of glass with the diameter of 22 meters, weighing 300 tons. The total height is 105 meters. The architect behind such an ambitious is Norman Foster, known for its hi-tech creations. To reach the glass ball you should rise in one of the panoramic lifts to the height of 86 meters. There you’ll find a bar and the panoramic hall in the center of which is installed the wooden globe with 17 petals signed by the representatives of world religions. Also, there is “Ayaly – Alakan”, the hand impression belonging to the President of Kazakhstan, N. Nazarbayev, the symbol of Kazakh people’s careful attitude toward peace on our planet. There you can look at Astana from a bird's eye view - the modern business district on the left bank of the Ishim, and cozy areas with squares on the right bank. Today Baiterek is strongly associated not only with the capital but also the whole country. He has become not only the symbol of the city but all of the Kazakh people preserving their historical roots and heading toward the future.